Yes. You caught me. I am "borrowing" another recipe from Mollie at Frugal Hausfrau. She has been on a big cornmeal kick lately. It all started with her post on Polenta Budino with Plum Marmellata that inspired my cornmeal/blueberry version. Then she posted a delicious looking Orange Apricot Snack Cake with more cornmeal in the batter. It looks and sounds delicious! Usually I only reach for cornmeal when I need cornbread to go with ham and beans or to sprinkle a little under a pizza crust. All of these new fun ideas had me inspired and hungry! Then I came to yet another one of her delicious looking cornmeal recipes. 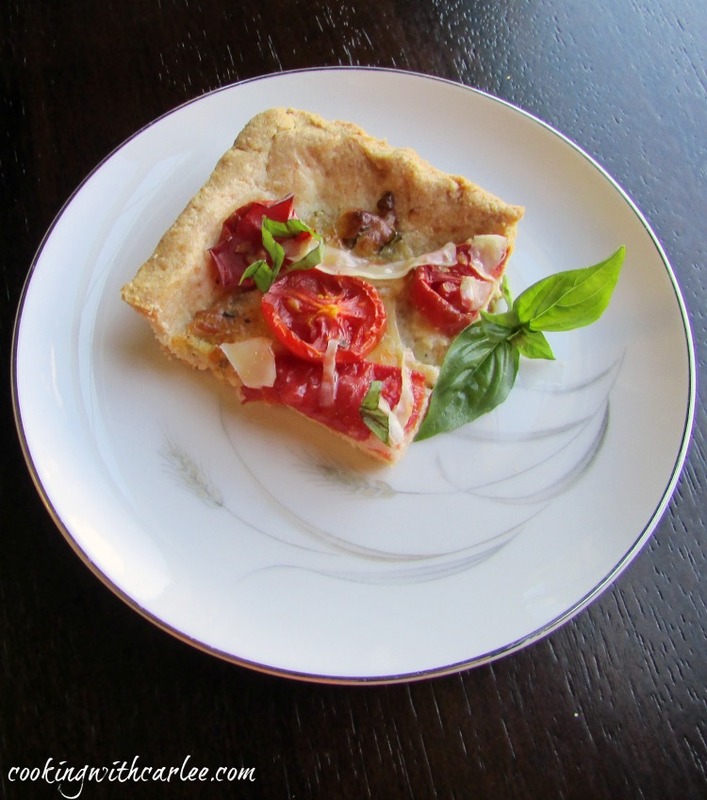 Her Garden Tomato Tart looked gorgeous, sounded delicious and allowed me to further indulge this little cornmeal obsession I have going right now. So, Mollie - I apologize for borrowing so heavily from you these past few weeks. I would say it's not you, it's me, but it wouldn't be true! You are posting too many delicious looking treats and fanning the flame! Our tomatoes are really delicious this year and have been coming off the vines in bucketfuls, so that helped egg me on. Not that I needed much of an excuse. As these things go, I didn't follow her recipe exactly. But I followed it closely enough to know hers is a real winner. So, if you like the direction this is going, but want it in a smaller and prettier package be sure to pay Mollie a visit. If you are looking for something fresh and fun to take to a potluck or have a small army to feed at home you are in the right place! Despite the fact I have a pretty decent collection of cook/bakeware (you know the kind that fills the kitchen, the pantry, the dining room, a couple of racks in the basement and now a bit of the coat closet... not that anyone is counting.) I don't have a tart pan. I'll put it on my wishlist now as there have been a few times recently I wished for one. Does anyone have a direct line to Santa? Though there are only three of us, we have regular extended family dinners so we almost always have volunteers to help eat new creations. Plus this is a great potluck contribution or would be great for a party as it can be made ahead and served at room temperature. I am more of a rustic/free form cook for the most part. 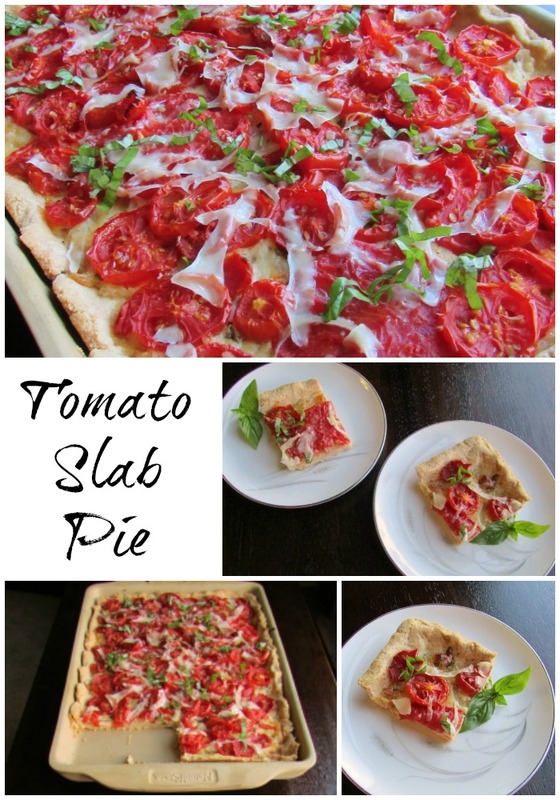 Slab pies fit my style. You can certainly make this crust look pretty, even as a slab pie, but it isn't necessary. It looks dressed up on it's own and doesn't need a lot of frill. So now you may be asking yourself how to best serve such a delightful treat. I think it would make a great summer lunch. Serve it alongside a nice green salad and an ice cold beverage. It would also make a fun starter for a party. Cut it into smaller squares and listen to your guests fawn over how delicious it is! It would also work as a starchy side to a nice grilled chicken breast and some fresh green beans or something. However you decide to serve it, you owe it to yourself to give it a try! Core the tomatoes and cut them into thin slices (somewhere between 1/4 and 1/2 inch would be fine). Place them in a strainer and sprinkle them with salt. Allow them to drain, gently mixing or tossing them every so often. In a food processor, mix together the flour, cornmeal and salt until combined. Add the butter and cheese and pulse until it forms pea sized chunks. Add a couple of tablespoons of water and pulse. Keep adding water a tablespoon at a time until the dough just comes together and forms a ball. You do not want to overwork the dough or add too much water, so go slow and add just a bit at a time until it comes together. Pat dough into a 10x15x1" bar pan. Place in the refrigerator for 15-20 minutes or until firm. Once the dough is firm, gently dock the crust with a fork being careful not to create too large of holes. Cover with parchment paper or aluminum foil and then pie weights (I use dried beans). Bake for 20 minutes then remove foil/parchment and weights and bake for 10 more minutes. Transfer to a wire rack to cool while you prepare the filling. While your dough is baking saute the diced onion in the cooking oil or bacon grease until translucent. Set aside to cool. Mix cooled onion, mozzarella, mayonnaise, chives, parsley, basil and black pepper. Spread over par-baked pie crust. Give the tomatoes one last shake and then arrange over the cheese mixture. Drizzle with a bit of extra virgin olive oil. Sprinkle top with Parmesan cheese and chiffonade of basil. Great served warm, at room temperature or cold. Santa just may have looked at your Amazon wish list only to find it empty. BTW - nice recipe. I think it turned out perfectly on the stoneware. It was really tasty, it probably even surpassed my expectations! I may have to fill up that wish list if Santa is looking! I love the idea of the parmesan in the crust. Brilliant! The Parmesan and cornmeal really work well in the crust. Just those few Tablespoons of cheese really gives it a great flavor! Thank you! It makes it taste like cheese straws, which I love!! Oooh, a galette would be a great way to make it too! yum! I hope you put the recipe up! This looks scrumptious!!! 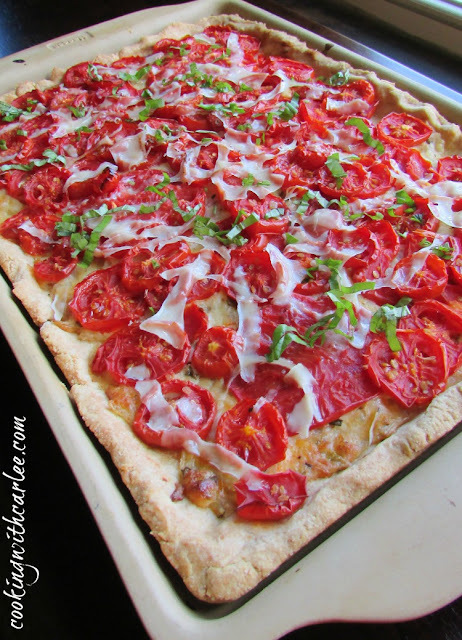 I am just loving all the fresh tomatoes this time of year and this sounds and looks AMAZING! Fresh tomatoes are the best, aren't they? It's hard for the store bought ones to compete. Thanks, Andrea! Thank you! It really is tasty! Yay! I don't have a tart pan either, so I love that adaptation. This looks amazing. Thanks for sharing your recipe with us at Merry Monday this week! Maybe we both need one on our Christmas list ;-) Though I've always been able to make due without, there have been a few times recently where I have really wanted one. Thank you! Looks Great! Thanks for sharing at our Tips & Tricks Link Party! It would be great for a picnic! Thank you! 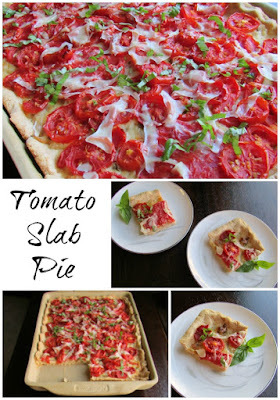 Slab pies are an easy wonder...I love that this one is savory instead of sweet! Aren't they great? And a perfect way to feed a crowd. Thank you! Carlee, I love that you made this into a slab pie! Perfect for our block party, so I'll probably use YOUR recipe!! :) You forgot to mention last week's Sloppy Joe Casserole on a cornbread crust, lol! I don't think I realized exactly how much of a cornmeal kick I'd been on until I read your post - and cornmeal isn't usually my "thing" being a Northern girl. It is now, though, and I'm flattered you've been inspired! See, you've really had a them going and I've been loving it! All of your stuff always looks so good! Thanks, Mollie! 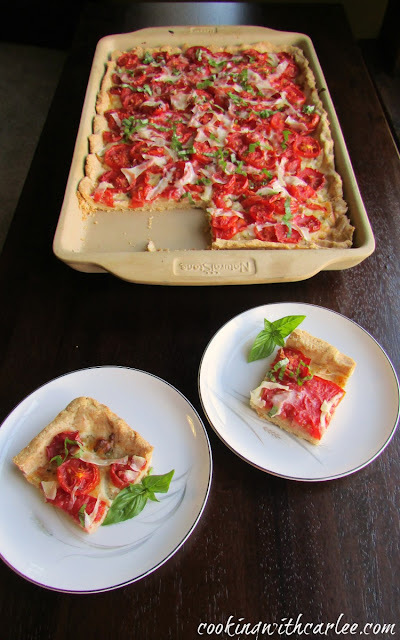 This tomato pie looks so delicious! Thanks for linkin' up with What's Cookin' Wednesday! I am really jealous, our tomatoes did not produce as much as usual, we had a weird summer of weather. I really need to amend the soil this year and feed it well. The really sad part is that the chipmunks, pests that they are, ate a lot of tomatoes too. At least they took a bite on one here and another there, and another. UG! One bite? Really? I am pinning this to make, I'm hoping for a few more nice tomatoes before the year is done, even if I have to fight the varmints for them! This looks too good to miss out on! Our squirrels are notorious for picking that tomato that you left on the vine for one more day to make it just right. They take one dang bite and leave the rest. I wouldn't mind (quite so much, anyway) if they ate the whole thing. Luckily we still had more than enough. I used mostly romas on this, but our beefsteaks were extra good for sandwiches this year. I'd have shared if you were just a bit closer! aw.. man, I wish I had seen this when my tomatoes were coming in this summer! Pinning so I can give this a try! Thanks for sharing at country fair blog party! Thanks, Jan! I hope you love it! Oh no! Keep the dog out! We have green tomatoes on the vine, it won't be long now! Sounds so great! Yum! Thank you for sharing on Merry Monday! Hope to see ya next week! Thank you! I'll see you there! 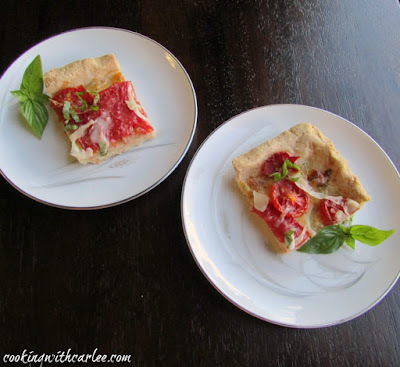 I've never had a tomato pie but hear about them all the time on the Food Network ;) What a great summer side dish! I think the most common ones are a southern thing. I still need to make a classic tomato pie one of these years. This one has a bit of an Italian bend to it that we really liked!